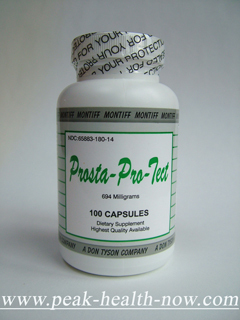 Prosta Pro-Tect, with saw palmetto extract, pumpkin seed extract, Beta-Sitosterol and Campesterol, also contains an array of select botanicals and antioxidants to maximize effective prostate support. Ingredients: This unique prostate support formula contains a special mixture of potent antioxidants, which have been shown in medical studies to help protect the prostate gland from free radical damage, and help in BPH. Saw Palmetto Extract, Grape Skin Extract, Tomato Powder Extract, Cranberry Extract, Calcium D-Glucarate, Silymarin Extract, Broccoli Sprout Extract, Beta-sitosterol, Pumpkin seed Extract, Mixed Tocotrienols / Tocopherols, D-Alpha Tocopheryl Succinate, Campesterol, Quercetin, Stigmasterol, Alpha Lipoic Acid, Grape Seed Extract, Selenicereus Grandiflorus Powder, Gingko Biloba Extract, Selenomethionine, Bilberry Extract, Origanum Vulgare Extract. • Providing potent antioxidant support to protect against free radical damage & assist in detoxification. • Supporting healthy prostate gland tissue by inhibiting potential carcinogenic activity. • SAW PALMETTO EXTRACT: Saw Palmetto Berry (a phytosterol) has steroid reductase inhibitor properties and creates antiandrogenic action; thereby inhibiting the enzyme, testosterone-5-α-reductase, which causes the enlargement of the gland. • BETA-SITOSTEROL: Active ingredient found in the Saw Palmetto Berry. Enhances T cell activity and is efficacious in improving urinary symptoms and flow in BPH, by removing toxins. • PUMPKIN SEED EXTRACT: has beneficial effects, and works synergistically with Saw Palmetto Berry for maximum results. It will also enhance the absorption of Lycopene. • BROCCOLI SPROUT EXTRACT: Has high anticarcinogenic activities. Contains sulforaphane, which has been noted by researchers to lower the risk of many forms of cancer, including prostate cancer. • D-CALCIUM GLUCARATE: A form of glucaric acid, a natural compound found in the body with detoxification properties. It helps by detoxifying harmful carcinogenic pesticides, such as DDT and Atrazine. • GRAPE SEED & GRAPE SKIN EXTRACT: Have reservatrol (compound in grape skin & wine) which may protect healthy cells from chemotherapeutic activity. Polyphenols in grapes may induce apotosis of prostate cancer cells. Also helps to increase Glutathione levels. • QUERCETIN: A flavonoid that inhibits free radical damage to cells, and has anti-inflammatory properties, which may be beneficial for prostatitis. • SILYMARIN EXTRACT: (from milk thistle plant) Hepatoprotectant – increases Glutathione in the liver and supports liver function. Helps detoxify the liver from, & protects against, tetrachloride & galactosamine. Contains silibinin, which may inhibit prostate carcinogenesis. • TOCOTRIENOLS: Tocopherols (mixed): Vitamin E suppresses androgen & antigen (PSA) receptors in prostate cancer. Tocotrienols are a special form of Vitamin E - with enhance free radical scavenging ability. • d-ALPHA TOCOPHERYL SUCCINATE: Another important form of Vitamin E, which is adjunctive to radiation therapy and assists in apoptosis. • ORIGANUM VULGARE EXTRACT: Contains the active phenolic compound, rosmarinic acid. It is an antioxidant with anti-inflammatory and cancerpreventative properties.